Hello, everyone! Its Broni here. I hope you all had a most wonderful Thanksgiving yesterday. I know I’m still stuffed! Today I’d like to show you a card with a background I created using Distress inks and the Dylusions Dotted Flowers stencil. I used several sponge daubers (I keep one for each color) and some Distress inks in Broken China, Frayed Burlap, and Walnut Stain to ink through my Dylusions Dotted Flowers stencil onto some light blue cardstock. I sponged the flower on the edge as well as randomly spacing the dots over the background. I also sponged around the edges with Frayed Burlap after distressing it with my Tonic scissors. I used my Frayed Burlap Distress Stain to darken the edges of my kraft colored mat layer. I like that I can get a distinct line of color using it. The tree from the WPlus9 Woodgrain Silhouette stamp set was inked in Walnut Stain and stamped onto some kraft cardstock, then sponged on the edges with Frayed Burlap as well. 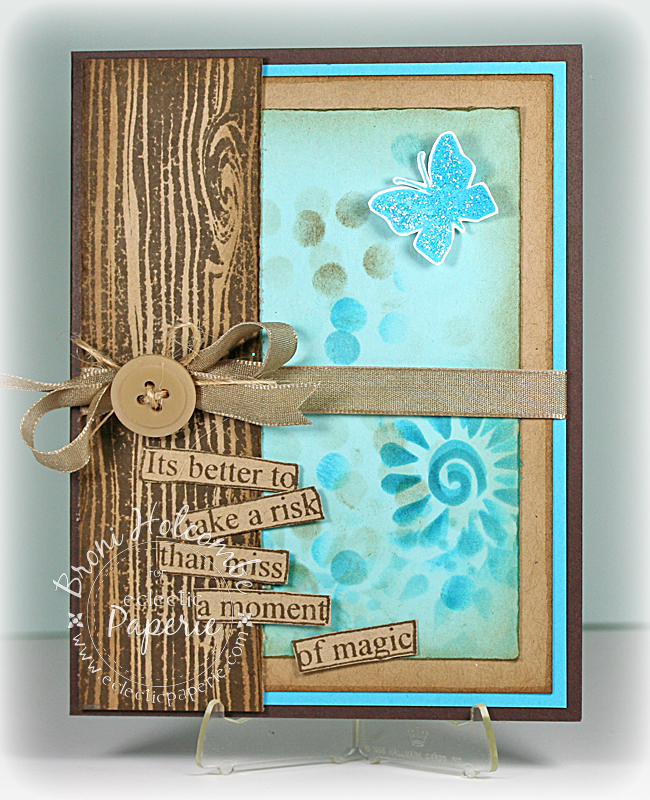 I stamped the butterfly from the same stamp set in blue ink onto white cardstock and cut it out, then added Star Dust Stickles to make it super sparkly! It’s popped up on Scotch foam mounting tape. My sentiment is from the Dylusions The Right Words stamp set. I love that you can stamp them and use them together or cut them apart, as I did, and use them however you want! How lovely - the turquoise and brown is such a lovely combination! Beautiful card - the color combination is so bright and happy! Wishing you a great weekend!